The response rate to the survey is the first indication of the level of employee engagement in the organization. Of the 588 employees invited to take the 2017 survey, 495 responded for a response rate of 84.2%. As a general rule, rates higher that 50% suggest soundness, while rates lower than 30% may indicate problems. At 84.2% A&F’s response rate is considered high. High rates mean that employees have an investment in the organization and are willing to contribute towards making improvements within the workplace. With this level of engagement, employees have high expectations from leadership to act upon the survey results. 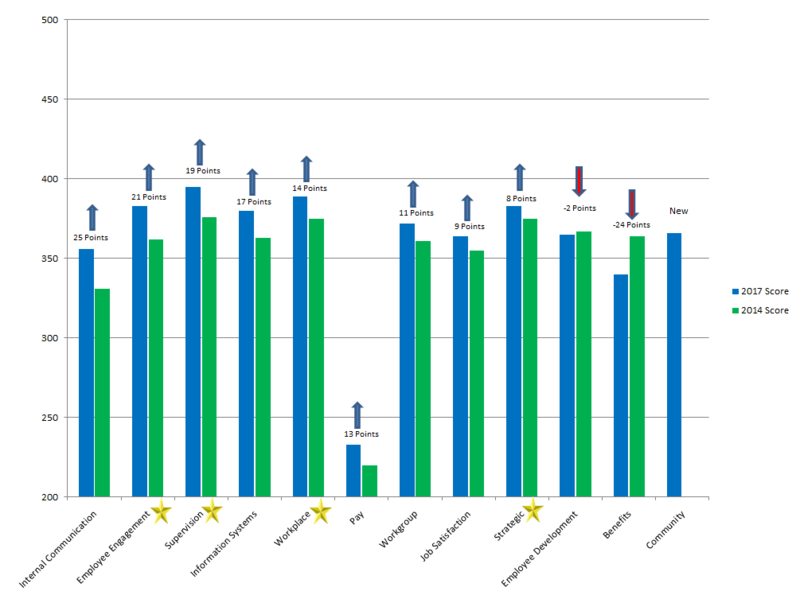 The overall score is a broad indicator for comparison purposes with other entities. Scores above 350 are desirable, and when scores dip below 300, there should be cause for concern. Scores over 400 are the product of a highly engaged workforce. In 2014, each A&F unit was tasked to evaluate the findings in their respective reports, identify areas of focus, and to formulate a plan of action for implementing change. Each unit was encouraged to engage employees within their unit with open discussions to interpret the data, identify targeted areas of follow up to collect additional information as appropriate, establish priority areas for improvement with scores less than 350, and implement plans for change. Supervision (Score 395) – The supervision construct captures employees’ perceptions of the nature of supervisory relationships within the organization. Higher scores suggest that employees view their supervisors as fair, helpful and critical to the flow of work. Workplace (Score 389) – The workplace construct captures employees’ perceptions of the total work atmosphere, the degree to which they consider it safe, and the overall feel. Higher scores suggest that employees see the setting as satisfactory, safe and that adequate tools and resources are available. Strategic (Score 383) – The strategic construct captures employees’ perceptions of their role in the organization and the organization’s mission, vision, and strategic plan. This construct measures the degree to which employees understand their role in the organization and consider the organization’s reputation to be positive. 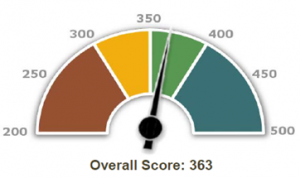 (Score 383) The employee engagement construct captures the degree to which employees are willing to go above and beyond, feel committed to the organization and are present while working. Higher scores suggest that employees feel their ideas count, their work impacts the organization and their well-being and development are valued. (Score 356) The internal communication construct captures employees’ perceptions of whether communication in the organization is reasonable, candid and helpful. Lower scores suggest that employees feel information does not arrive in a timely fashion and is difficult to find. (Score 364) The job satisfaction construct captures employees’ perceptions about the overall work situation and ability to maintain work-life balance. This construct measures the degree to which employees are pleased with working conditions and their workload. 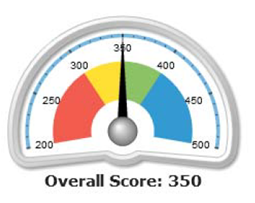 (Score 365) The employee development construct captures employees’ perceptions about the priority given to their personal and job growth needs. This construct measures the degree to which employees feel the organization provides opportunities for growth in organizational responsibilities and personal needs in their careers. As in 2014, each A&F unit has been tasked to evaluate the findings in their respective 2017 reports, identify areas of focus, and to formulate a plan of action for implementing change. Each unit is encouraged to engage employees within their unit with open discussions to interpret the data, identify targeted areas of follow up to collect additional information as appropriate, establish priority areas for improvement, and implement plans for change.